Discussion in 'Arts and Photography' started by TheMightyS, Aug 29, 2012. We may be on the verge of an astronomical renaissance. Once complete, the Large Synoptic Survey Telescope hunt for dark energy and matter throughout the Southern sky from its perch atop Cerro Pachon in Chile while producing a staggering 60 petabyte public data archive. Now, we just need to figure out how to pay for it. 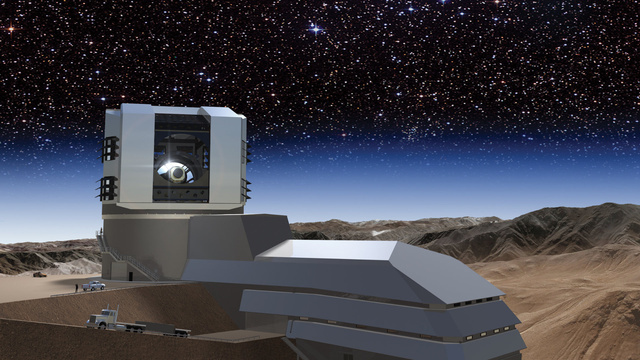 When it begins operating around 2022, the LSST will revolutionize our understanding of the universe through an unprecedented decade-long survey of the Southern sky. 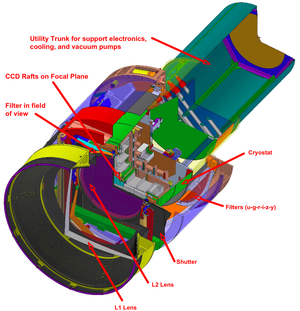 The LSST itself is an 8.4 meter ground-based telescope employing a 3200 MP camera and innovative triple-lens design. The LSST features an extraordinary 3.5-degree wide field of view, much wider than other similar-sized ground-based observatories. For reference, the moon takes up about half a degree (or .2 square degrees) when viewed from Earth. When paired with the telescope's relatively short double 15-second exposures and 3.2 Gigapixel sensor, the LSST will be 1000 times more capable than existing facilities. It will scan a 20,000 square degree swath of the sky every few days—generating roughly 20 TB of data each night. "We actually move very quickly. Within five seconds, we can move from one piece of sky 3 1/2 degrees over and get ready for another exposure." William Gressler, senior optical engineer for the LSST, said. In all the, the LSST will snap a pair of 15-second exposures every twenty seconds, imaging every spot in the sky nearly a thousand times over a ten year span. To ensure that these images are distortion-free, the LSST will rely on a triple-mirror design. The primary mirror is 8.4 meters wide, the secondary mirror behind it will be 3.4 meters wide, and the 5 meter wide tertiary mirror will actually sit in a hole cut from the primary. In fact, the primary and tertiary mirrors are being cut from a single piece of "M1M3 monolith" glass. Managing the torrent of data may be the most most challenging aspect of the system. The estimated 20TB nightly dump is far beyond the review capabilities of even the most dedicated research assistant. So the LSST will feature cutting-edge data mining technology, harnessing more than 150 petaflops of computing power to do the job. All of the data, both the 60PB of raw and the 15PB of cataloged data, will be made available to the public. Look for Google Sky to get a serious upgrade come 2032. Nicko, WingZero, MajinBuu and 1 other person like this.